At Bravo Media, we love helping out brands, new or old, with our smart, flexible, and innovative digital media solutions including brand development, video production, and web design. We provide new and effective ways to tell your brand story and we will help you achieve just what you want. Our innovative brand development strategies can help you create an everlasting bond with your ideal audience and eventually benefit your business in the long run. Websites play an integral role in shaping the direction of your marketing strategies. Hence it is quite essential to plan the best possible web design for your business to influence your target audience in the best possible way. Web design can help prioritize your brand essentials and have a remarkable impact on your consumers. So get in touch with us today to get a well accomplished custom web design for your business and help grow your brand to the next level. At Bravo Media, we think as much about our client’s success, as they think about theirs. At the same time, we are also committed to grow as an agency, where different talented minds come together to offer their relentless services to clients from all over the world. Clients and technologies keep changing, but what remains steady is our commitment and accountability towards our client’s projects. The end results matter to us, and take accountability for all our projects. We are always curious to learn new marketing strategies in the area of brand development, video production, and web design, and this is how we strive to grow and enhance our expertise. At Bravo Media, we deliver what we promise and add excellent value to our client’s projects, be it brand development, video production, or web design. Our team is always driven to deliver more than what is expected by our clients. We will ask you a lot of questions to understand your company’s essence and all its needs. We believe that an open and honest communication network is essential to build trust with our clients. We are always committed to client success, and this is what motivates our team to come up with optimum media solutions for them. Outcomes matter equally as much to us as they matter for our clients. At Bravo Media, we help you create a well-executed strategy to tell your brand story in the most innovative and effective way. Our creative director will guide your brand’s content strategy, and our creative team will be there with you at every step of the process. We leave no stone unturned with our planning and execution to help you target the right audience and improve your sales efficiency in the long run. At Bravo Media, we use the latest technologies and the newest trends in the market to create a modern and updated brand development strategy for you. You can trust our services, as we come up with the best solutions for your brand development needs, without compromising on your budget specifications at any cost. We understand the value of branding for businesses in the present times, and thereby we make sure to create brands that are not only powerful, but also memorable. With an objective to stay true with your company’s character, we first work on identifying your business model in our initial strategy. Inspire and create new bonds with your consumers, with the help of our innovative brand development solutions. Bravo Media offers innovative and effective solutions to carve a unique brand identity for your business. We help you craft your brand story in the most compelling way, to make sure that it connects brilliantly with your ideal consumer. We put in a lot of research before creating the perfect and most suitable concept for your brand story. At Bravo Media, our main objective with our brand development strategies is to help you reach your true audience. That is why we ensure a comprehensive assessment of your target audience on various social media platforms along with the current market tendencies in your industry, to come up with the perfect plan for building your unique brand. We offer solutions for web development projects from diverse industries and business domains. Be it a startup, or a big enterprise, we deliver the best in class functionality for all of them. We offer the best solutions that improve your business with guaranteed results. Get in touch with us for a promising business performance and quick outcomes. We take full care of all the factors that go into making a video for your brand to make it a successful production. We also take your budget needs into complete consideration throughout the video production process. On the whole, you can trust Bravo media for its pre-production, production, and post production services. Our team of talented and creative graphic designers makes sure to fulfill your vision and ideas by creating the perfect graphic designs for your brand. Collaborating with us for your graphic design needs, your brand message will be accurately translated with our efficiently executed work. Our web design services can help your business grow, influencing greater brand loyalty for the future. We offer custom web solutions for distinct business models, building a dynamic experience for our clients all over the world. Get in touch with us to help your business grow with our innovative and flexible solutions! Welcome to Bravo Media! We are a digital media agency that offers customized media solutions in the field of brand development, video production, and web design for clients all over the world. Whether you want to build a new brand or want to improve your existing services, our media solutions have you all covered. Just give us a call or drop in an email and we would love to respond! © 2018 Bravo Films Inc. All Rights Reserved. 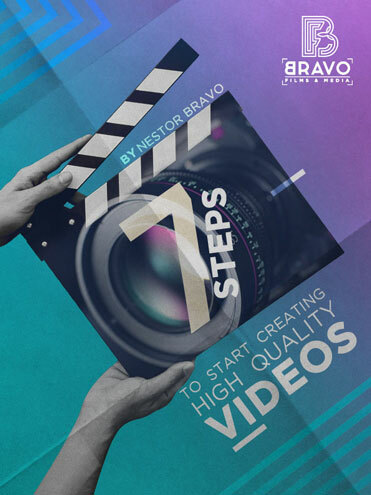 DO YOU WANT OUR FREE VIDEO PRODUCTION GUIDE? A comprehensive guide about the right process to make professional looking videos without breaking your bank. "We respect your privacy and we will not share your personal information"